Philo Ridge Farm was established by owners Diana McCargo and Peter Swift in 2012 in an effort to preserve the historic Foote Farm and continue the agricultural legacy of the property. Today, we are a diversified farm using regenerative practices to produce pork, chicken, lamb, beef, wool products, hay, vegetables, fruits, small grains and flowers. Learn more about the history of this beautiful property here. 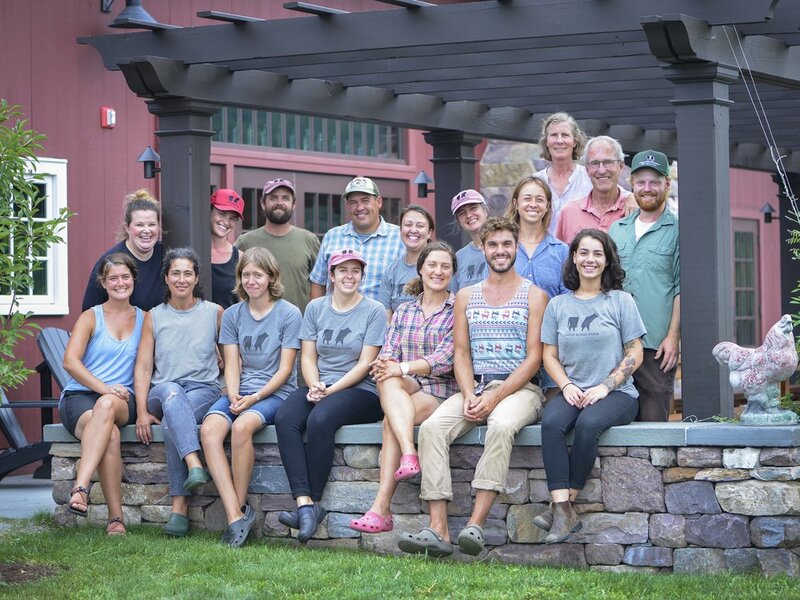 The farm is lead by Farm Manager Ed Pitcavage and has a growing, diverse and devoted team made up of Jamie Broe, Meg Dawson, Jane Engelman, Ian Johnson and Sean Richards, as well as our devoted market, kitchen, livestock, and farm crews. Support and business planning is provided by Bio-Logical Capital, a land investment and conservation company. The livestock and land management plan of Philo Ridge Farm focuses on producing grass-fed and pasture-raised livestock, which is processed and sold in the market. The team manages over 200 acres of hay and rotationally grazed pastures as well as oversees the landscape maintenance. 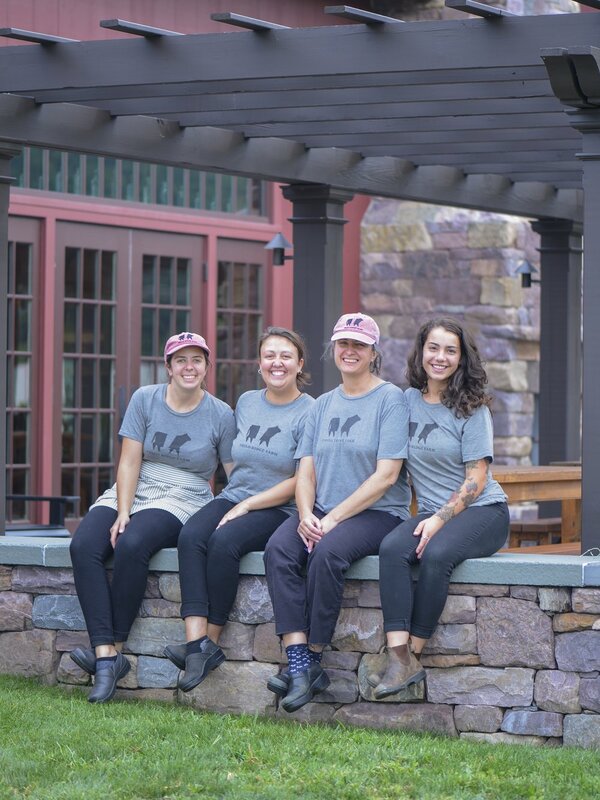 The Market and Kitchen allows us to sell on-site what we grow and raise right from our beautiful farm, support our neighboring farmers, and be a positive force to improve the local agricultural economy of Vermont’s Champlain Valley. Learn more about our Market, including when you can visit, here. The Market Garden is the certified organic vegetable, flower, herb and fruit production center of the farm. We have two acres in production growing everything from arugula to zucchini, all of which goes into the market and processing facility. Meg began working in professional kitchens in high school, but chose to dedicate her life to food at a much earlier age. She has since worked in several bakeries and restaurants in New York, Vermont, and her hometown of Richmond, Virginia. She strives to keep her baking as simple and natural as possible, highlighting the amazing products from the farm and surrounding area. Meg has a degree in Religious Studies from the University of Virginia. When not on the farm, she enjoys birdwatching, yoga, reading on her porch, and trying to get her adopted cat, Puck, to play with her. Jane comes to us with over 12 years of farm experience. From Alpine orchards in Italy to educational gardens in Chicago, she has explored many facets of the international growing community. Jane grew up in Evanston, IL and is a graduate of Green Mountain College with a degree in Organic Agriculture and Sustainable Community Development. 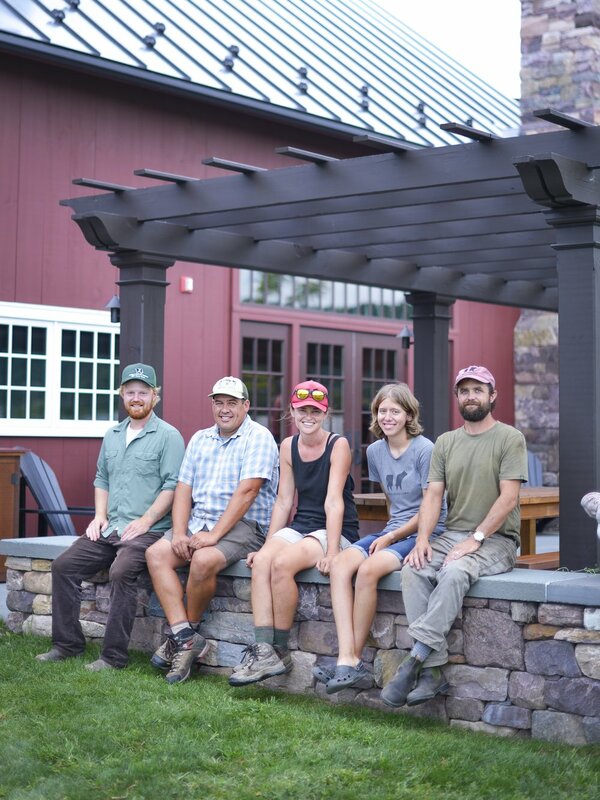 Prior to joining the Philo Ridge Farm team, Jane owned and operated Sweet Roots Farm, a diversified vegetable production in the foothills of Maine. When not on the farm, Jane can be found spending time in the mountains with her husband Dan and their dog Daisy. She enjoys hiking, skiing, preserving the harvest, and spending time with her ever-growing family all across the country. Ian’s always been fascinated with animals in their natural habitat. 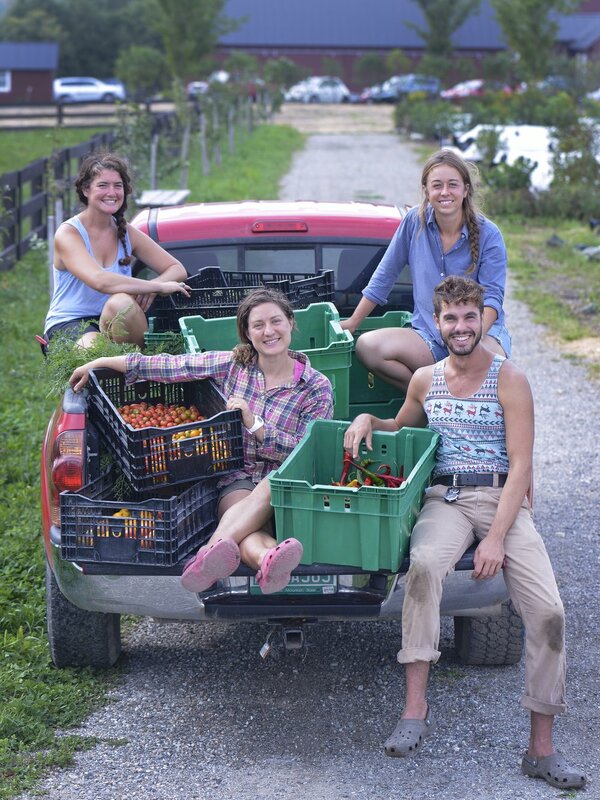 While studying ecology at the University of Vermont (UVM), Ian became inspired by biological regeneration and agriculture’s potential to feed the soil, the encompassing ecosystem, and the human community. Following graduation, Ian enrolled in UVM’s Farmer Training Program to learn the necessary farming tools to regenerate the planet and live off of the land. After the program he decided to work closely with animals, knowing that they would be a vital part of a thriving farm ecosystem. He then began at Farm and Wilderness, where he helped manage pasture and marginal lands using multiple species, each in habitats suited to their nutritional and behavioral needs. At Farm and Wilderness, Ian also had the opportunity to lead small groups of kids and councilors in farm tasks. Now at Philo Ridge Farm, Ian helps manage the livestock program and continues his love of working with animals. 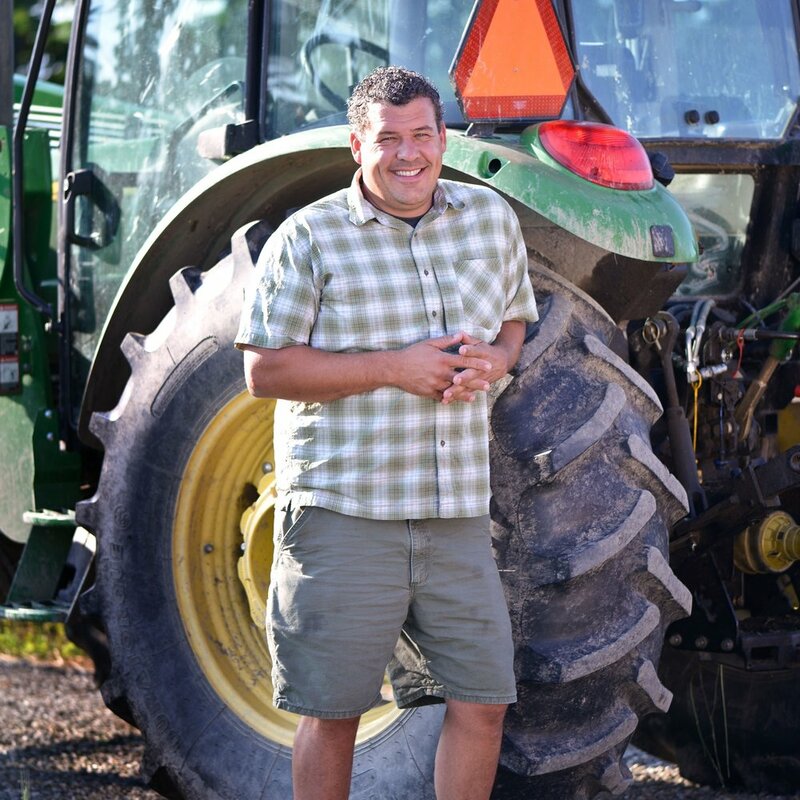 Ed is our Farm Manager who moved to Vermont when he started at Philo Ridge Farm in 2016. Prior to joining the Philo Ridge team, Ed managed six reservations for a land trust in Massachusetts, which included a diverse working farm, a Fredrick Law Olmstead designed park, numerous grasslands, woodlands, hiking trails, and waterfronts. Ed grew up in Northeastern Pennsylvania and graduated from the University of Pittsburgh with a degree in Political Science. He started his career in legislative affairs on Capitol Hill in Washington, D.C. After leaving the Hill, Ed spent summers living in a tent monitoring ground nesting birds on Nashawena Island, counted by-catch on commercial fishing vessels in the Atlantic Ocean, managed an ocean research grant program before finding his passion of sustainable agriculture at Weir River Farm in Hingham, MA. Ed spent the last decade building a diversified livestock operation and 150 member CSA program in a community focused educational farm. When not on the farm, Ed can be found spending time outside with his wife Lynn and children Abbey and Sam along with their two dogs Parker and Otter. He loves cows, enjoys fly-fishing, skiing, and time in the mountains and on the lake. Sean grew up in Fair Haven, Vermont at the bottom of Lake Champlain. He has spent his entire educational experience in Vermont from preschool through culinary school at the New England Culinary Institute. Sean spent the last twelve years away from Vermont traveling, eating, and cooking. He settled for a bit in the hills of Tennessee working at the prestigious Blackberry Farm. While at Blackberry Farm, he refined his cooking skills, food knowledge and learning the true meaning of hospitality. After cooking at Blackberry Farm, he was given the chance to travel and cooked for bands and musicians all over the U.S. and Canada. He spent his days off eating at the best restaurants he could find absorbing all he could from fine dining to local dives. After years of living out of a suitcase he settled back in Tennessee to open Knox Mason, a small farm to table restaurant. He learned how to work with farmers and local producers. After years away, like so many others, Vermont called him back. Sean’s passion for the simple seasonal cooking and a love of everything local helps to guide the kitchens at Philo Ridge Farm.